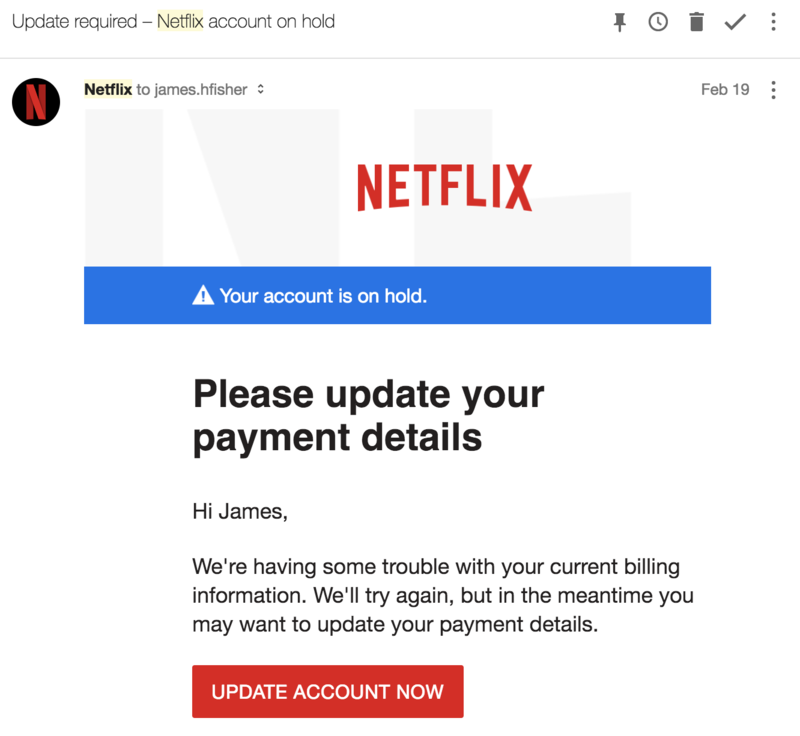 “Odd,” I thought, “but OK, I’ll check.” The email is genuinely from netflix.com, so I clicked the authenticated link to an “Update your credit or debit card” page, which is genuinely hosted on netflix.com. No phishing here. But hang on, the “Update” page showed my declined card as **** 2745. A card number I don’t recognize. Checking my records, I’ve never seen this card number. What’s going on? Netflix does not know about this Gmail “feature”. Externally, jameshfisher@gmail.com and james.hfisher@gmail.com are different identities, and should have their own Netflix accounts. I signed up for Netflix account N1 backed by jameshfisher@gmail.com in 2013. But in September 2017, someone, let’s call her “Eve”, created a new Netflix account N2, backed by james.hfisher@gmail.com. Eve has access to account N2 because she set its password when signing up, but I also have access to the account because I own james.hfisher@gmail.com, and so I can follow the password reset process for this account. I did so. Eve loves her TV! She’s watched 587 titles in six months, all from her “Android Device” in Alabama. She watched three seasons of Trailer Park Boys over a single day in October. She consumed nearly every day until 22nd March, when Netflix put her account “on hold” due to payment failure. Eve had paid for these shows. She paid $13.99 every month for her Premium plan, until February when her card **** 2745 (also billed to Huntsville, Alabama) was declined. Perhaps this was all a mistake? Perhaps Eve is actually one of the twelve James Fishers in Huntsville, AL, and perhaps he typed his email address in wrong when he signed up months ago. Netflix doesn’t do any email address verification when you sign up; you can start watching shows straight away. Change the email for the Netflix account to eve@gmail.com, kicking Jim’s access to this account. 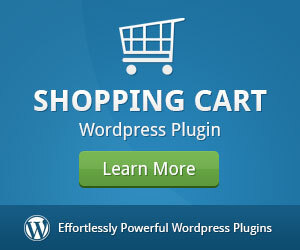 Where is the security flaw here? Some would say it’s Netflix’s fault; that Netflix should verify the email address on sign up. But using someone else’s address on signup only cedes control of the account to that person. 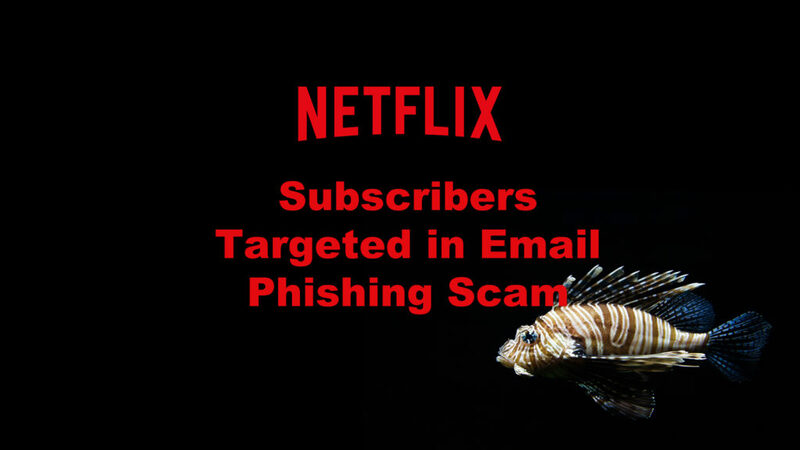 Others would say that Netflix should disallow the registration of james.hfisher@gmail.com, but this would force Netflix and every other website to have insider knowledge of Gmail’s canonicalization algorithm. Actually, the blame lies with Gmail, and specifically Gmail’s “dots don’t matter” feature. The scam fundamentally relies on the Gmail user responding to an email with the assumption that it was sent to their canonical address, and not to some other address from their infinite address set. Some Gmail power users might claim: “The dots-don’t-matter feature is great. 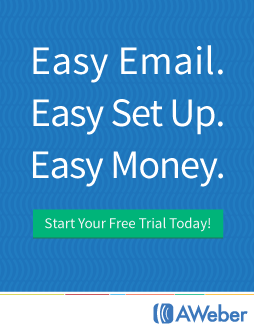 I get ownership of an infinite set of email addresses!” But firstly, no one wants this infinite set of email addresses. Those who really want infinite addresses already have the “plus labelling” feature: I also own jameshfisher+spam@gmail.com, jameshfisher+work@gmail.com et cetera. Plus labelling is a similar feature, but with similar scam potential, although with some legitimate use cases. But I have certainly never wanted j.ame.s.h.fis.h.e.r@gmail.com, and John Smith never wanted jo.hn.sm.ith@gmail.com. I have never asked someone for her email address only for her to reply, “it’s jane.doe@gmail.com, but feel free to add the dot wherever you like.” Each Gmail user has one email address that they think of as theirs; all the others are mistakes. Not only do Gmail users not want these extra addresses, most are not even aware that they have these addresses. I’m sure my parents are unaware that they own an infinite set of email addresses. They won’t know this, because Google have never told them, and this is not how email works anywhere else. Even the most technically minded Gmail power user refers to “my email address”, not to “my infinite set of email addresses”. Even those Gmail users who are aware of their infinite set of addresses are probably unaware of the scams that this exposes them to. We teach people about “phishing” due to emails from dodgy email addresses, but we don’t teach people anything about phishing due to emails to dodgy addresses. Nevertheless, the result is the same: the victim loses money to someone else. And even in the rare case that a Gmail user is aware of their infinite set of addresses, and they’re aware of the phishing attacks that this can expose them to, this user is unlikely to pick up on it, because the user interfaces of Gmail and Inbox don’t hint anything about a possible scam. In fact it barely even acknowledges that the email was to a non-standard address. The only clue in the screenshot above is that the interface says “to james.hfisher”, instead of “to me”. Finally, Gmail users should be able to opt out of dots-don’t-matter. I wish for any mail sent to james.hfisher@gmail.com to bounce instead of reaching my inbox. The dots-don’t-matter feature should be disabled by default for any new Google accounts, and eventually retired.